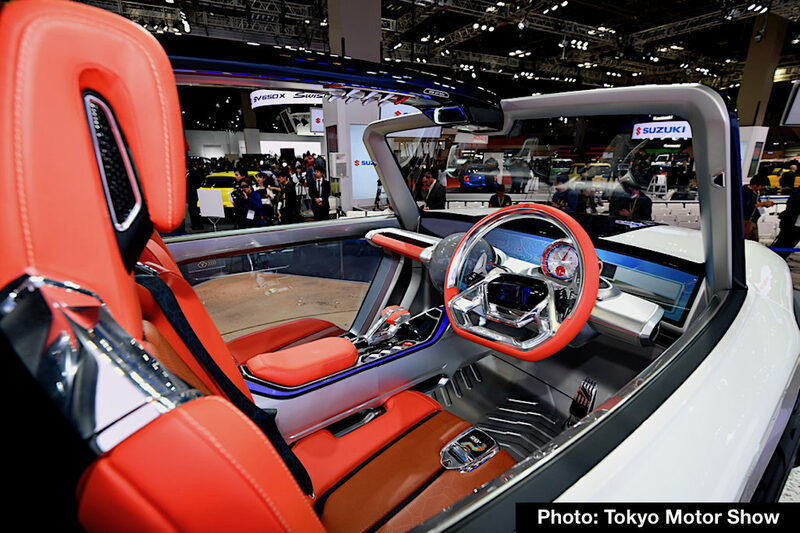 As the largest car show in Japan, the biennial Tokyo Motor Show attracts hundreds of thousands of visitors to Tokyo Big Sight to see the latest concept and production vehicles, motorcycles, commercial vehicles, parts and accessories, and much more. 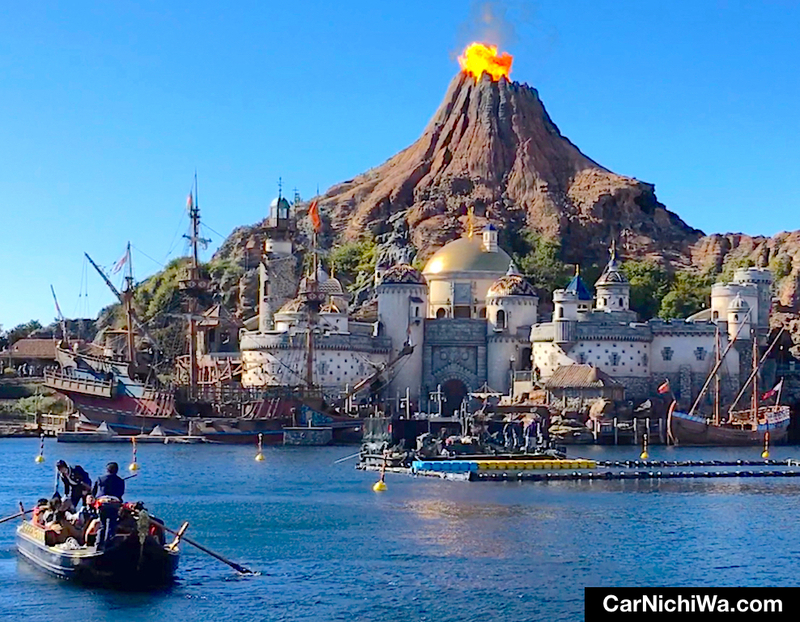 Thousands of journalists from Japan and across the globe attended the press preview staged for two days prior the show’s public opening. Our editor made the above photo while waiting patiently in line for early access to media facilities. 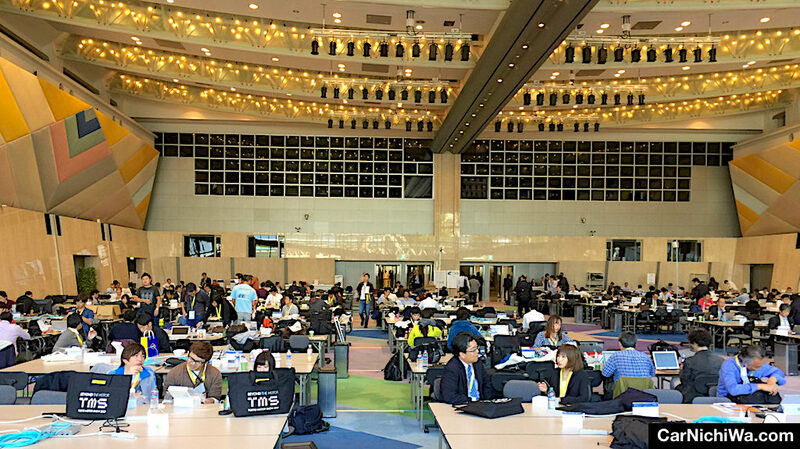 We thank the staff and organizers of the Tokyo Motor Show and the Japan Automobile Manufacturers Association for providing excellent on-site services including the spacious press room (above). Whether it was editing videos and photos on our laptop, stopping for a quick bite to eat, or simply relaxing in a comfortable chair for a few minutes, we really appreciate the media center. 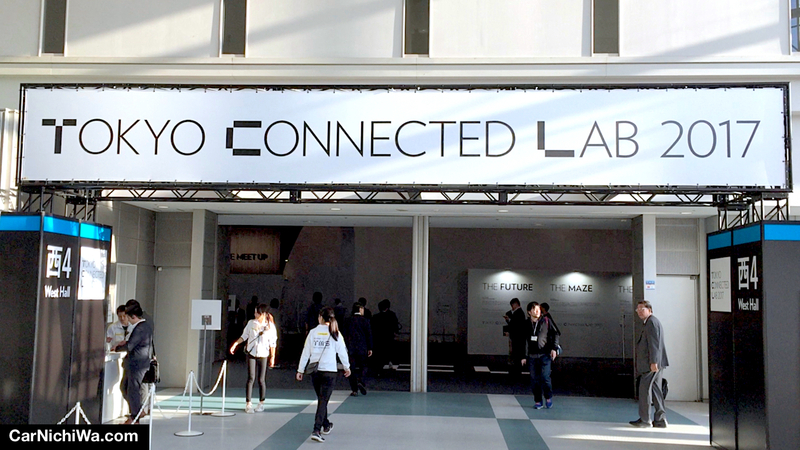 Let’s continue with our show report and take a look at the Suzuki, Daihatsu, Isuzu and Yamaha displays, plus the new Tokyo Connected Lab. It’s fun to visit the displays of automakers that once sold cars in the U.S. market under their own nameplates. 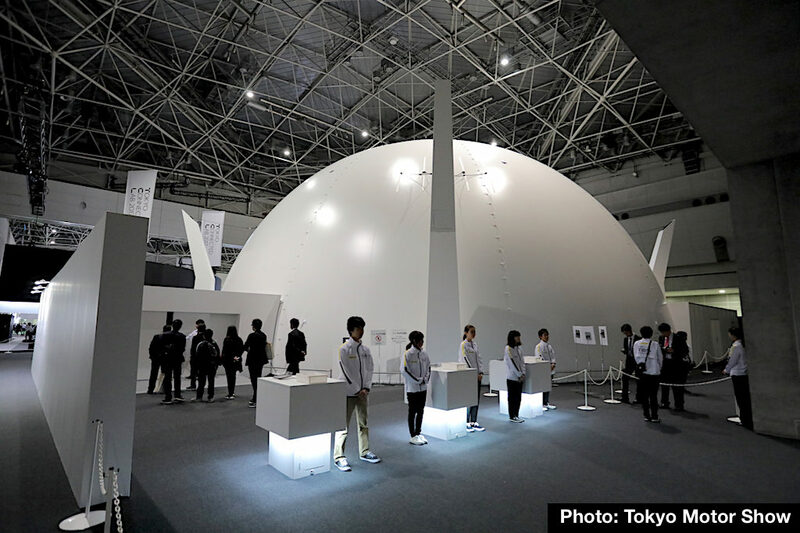 Suzuki had a great exhibit at this year’s Tokyo Motor Show while looking forward to celebrating the brand’s 100th anniversary in 2020. Suzuki’s new e-Survivor reminded us of retro-future concept vehicles at past Tokyo Motor Shows, particularly in the 1990s, when designers let their imaginations run free. The e-Survivor concept appeals to folks of all ages. 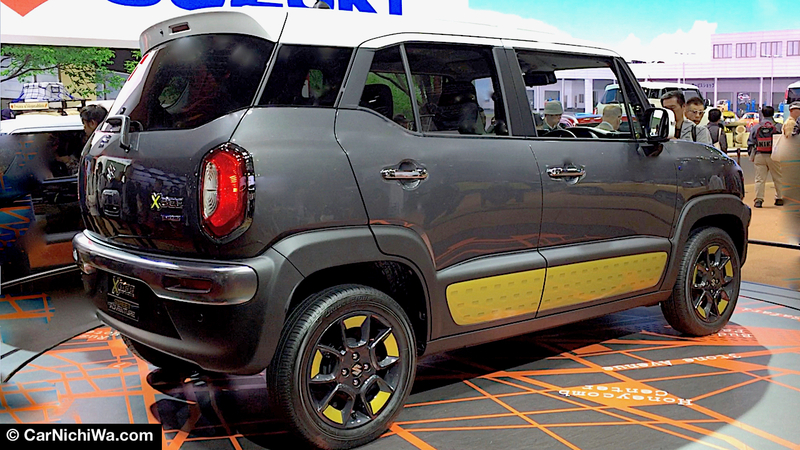 Suzuki described it as a “compact SUV of the next age, which inherits the magnetic identity of Suzuki from the Jimny and the Vitara.” Built on a compact frame topped with a lightweight body, it’s fitted with an independent four-wheel-drive system that employs in-wheel motors. Suzuki gave a bold new look to the mini-wagon with the Spacia Custom Concept (above) that made its world debut at the Tokyo Motor Show. 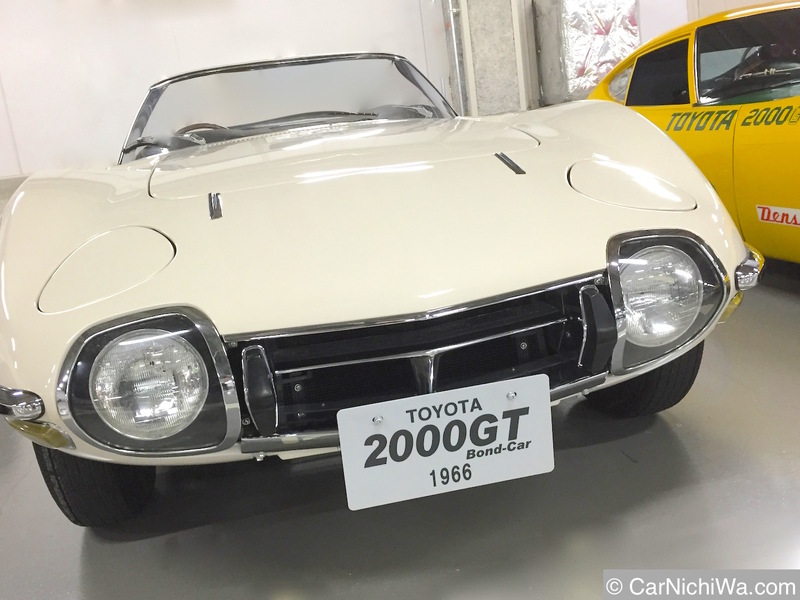 Suzuki has a long history building mini vehicles, or “Kei Cars,” for the Japanese market. The Spacia Concept is a tall mini with sliding doors on both sides, while the Spacia Custom Concept projects a more dynamic and trendy look. 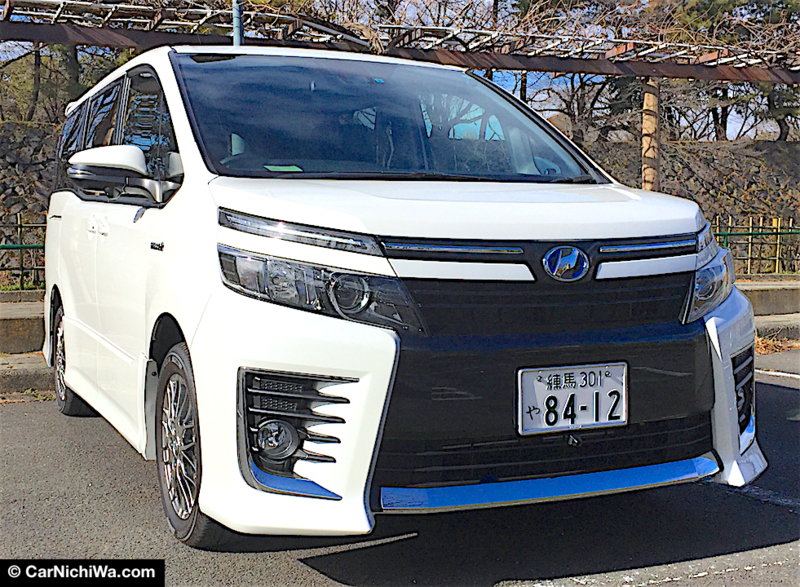 A huge chrome grille, often seen on larger vans in Japan, really makes it stand out. At the first Tokyo Motor Show we attended in 1993, Suzuki introduced the WagonR mini vehicle. 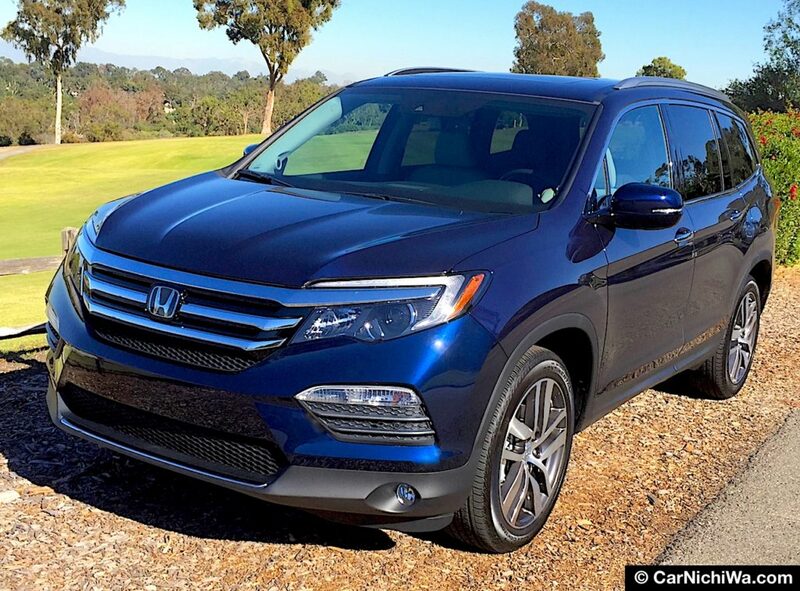 Since then, the automaker has sold an amazing 4.4 million copies of the tall wagon. 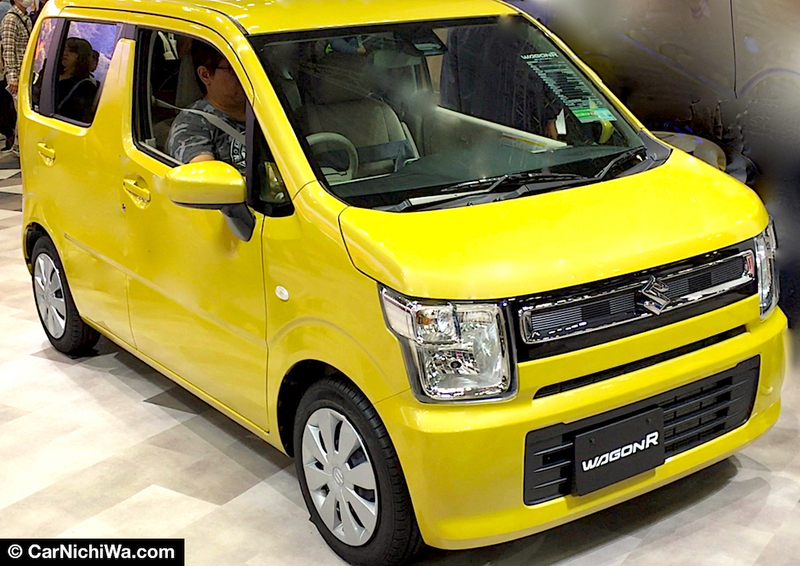 The sixth generation WagonR (above) introduced earlier this year was dressed in an eye-popping shade of yellow at the show. WagonR Hybrid models feature a mild hybrid system with idle-stop that allows the car to drive only on electricity when starting out. Inside, the modern cabin can be fitted with high-tech features like a head-up display. Sophisticated safety features include Dual Sensor Brake Support that uses a monocular camera and laser sensor to detect pedestrians and vehicles ahead. Described as a compact crossover wagon of a new genre, Suzuki showed several different versions of the XBEE in Tokyo including the Outdoor Adventure model (above) and Street Adventure (below). 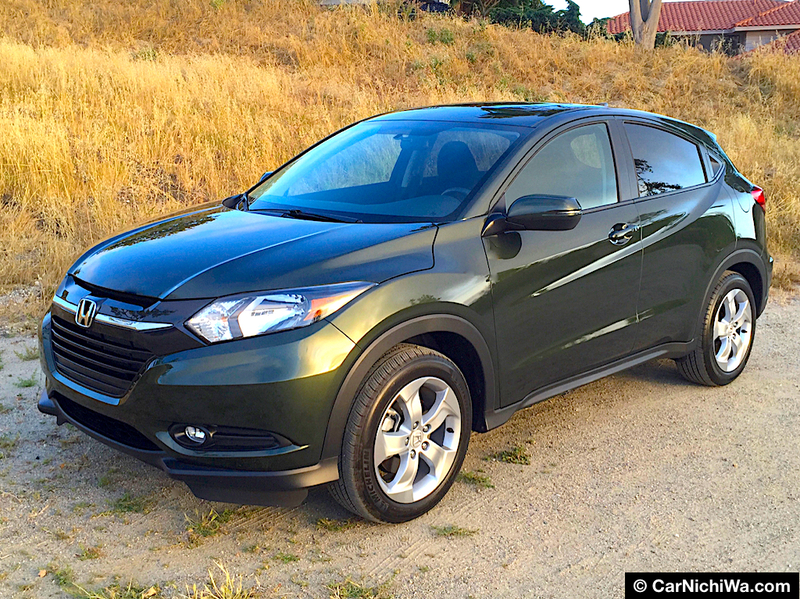 Automakers are dressing up small cars with rugged design cues to appeal to younger buyers. Suzuki says the compact size of the XBEE makes it easy to maneuver. The XBEE Outdoor Adventure concept is fitted with a 4WD system featuring Sport, Snow, Grip Control and Hill Descent modes. 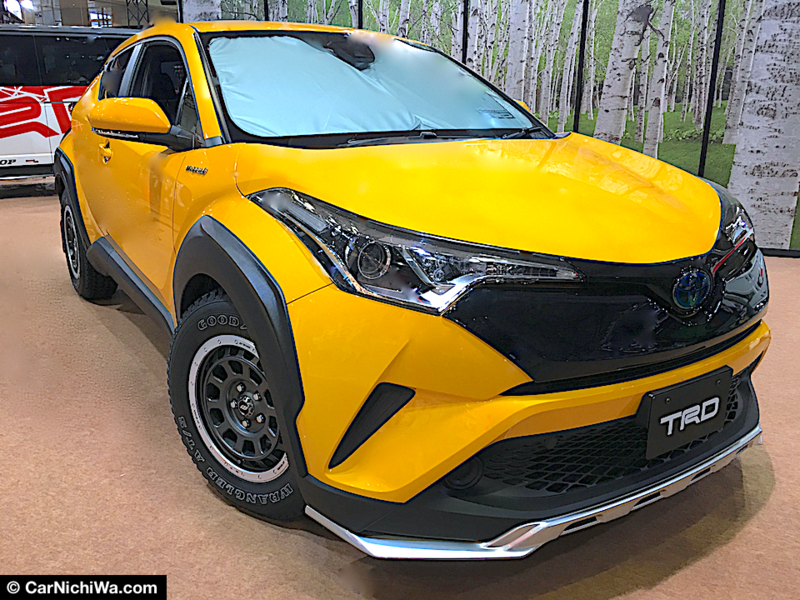 The XBEE Street Adventure concept focuses on fashion-conscious individuals with three-tone color coordination and a distinctive interior dressed with map-themed panels. 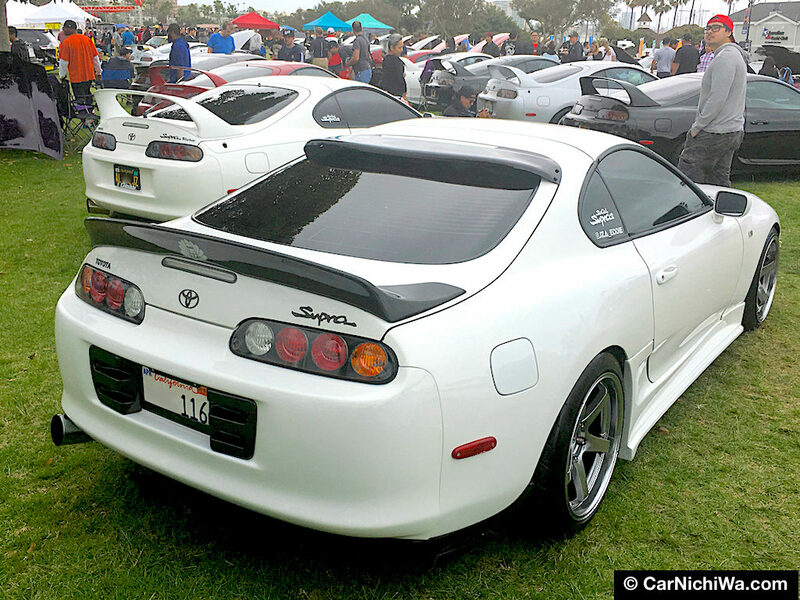 Under the hood is a 996cc 3-cylinder turbo gas engine with an intercooler and mild hybrid system. 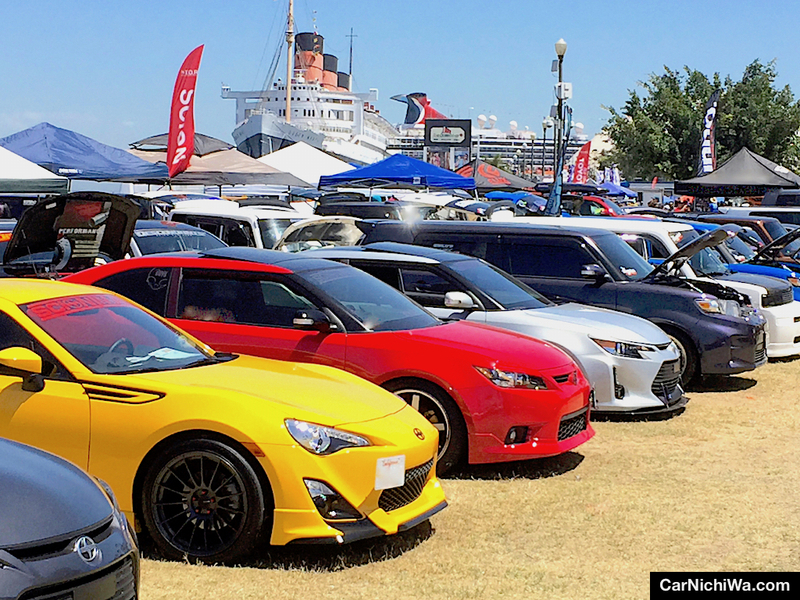 Daihatsu, which had a brief run under its own name in the U.S., has become a wholly owned subsidiary of Toyota. 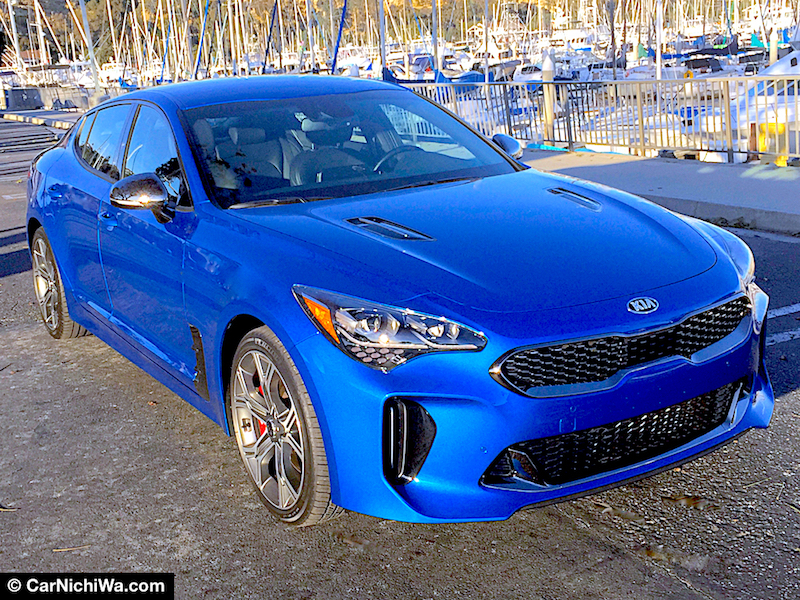 While it’s unlikely the brand name will return to the states, the small car maker continues to deliver a unique sense of style. Daihatsu’s stylish DN Compagno four-door coupe was one of several new concept vehicles making their world premiere at the Tokyo Motor Show. 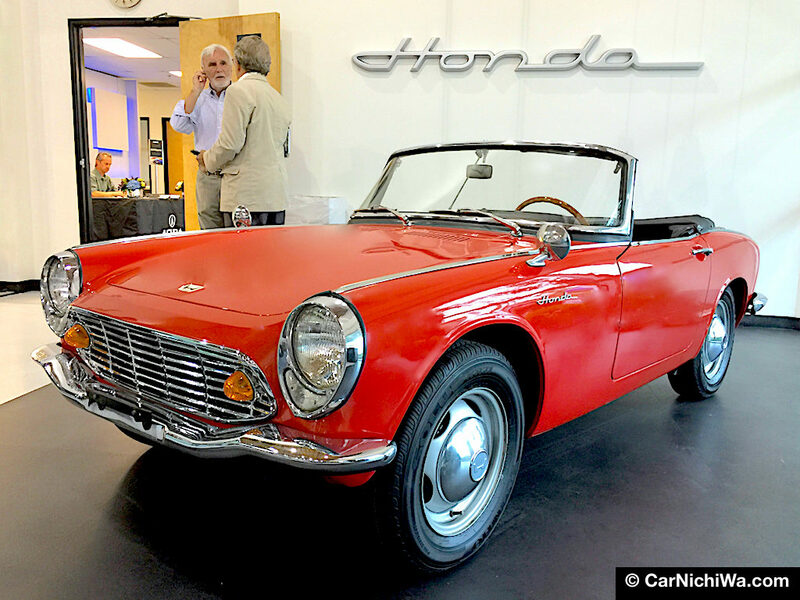 While Daihatsu builds a lineup of small and functional vehicles like the Boon and Thor, the automaker turned the clock back more than 50 years by naming its latest concept DN Compagno. 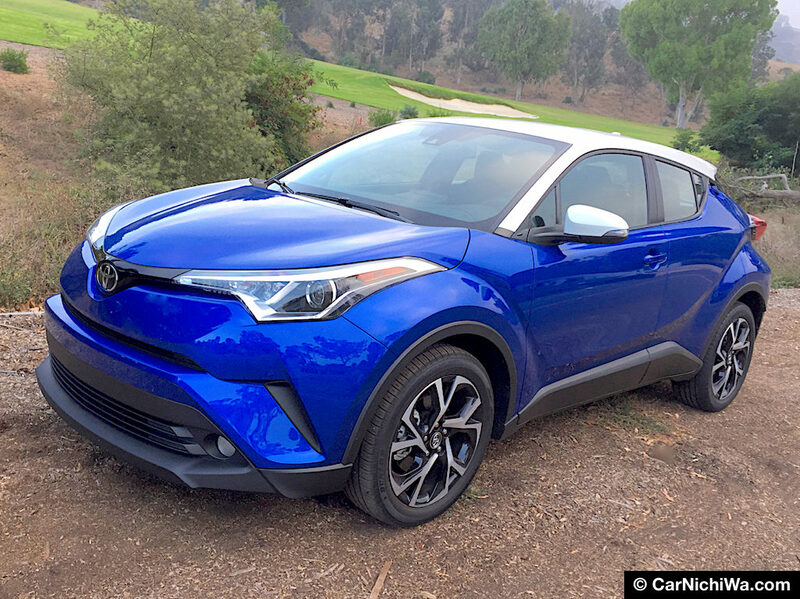 Targeting “active seniors” with features like comfy seats and retro-influenced styling, powerplants could include a 1.0-liter turbo engine or 1.2-liter gas-electric hybrid. 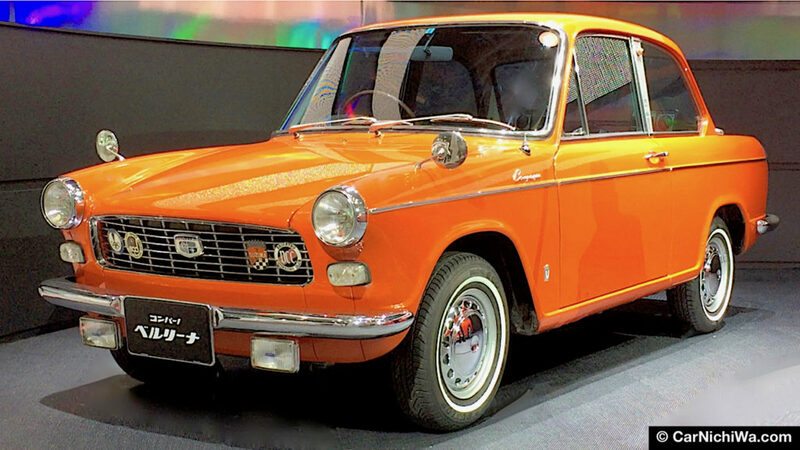 Daihatsu displayed a nicely restored example of an original Compagno coupe that was launched in Japan in 1963. 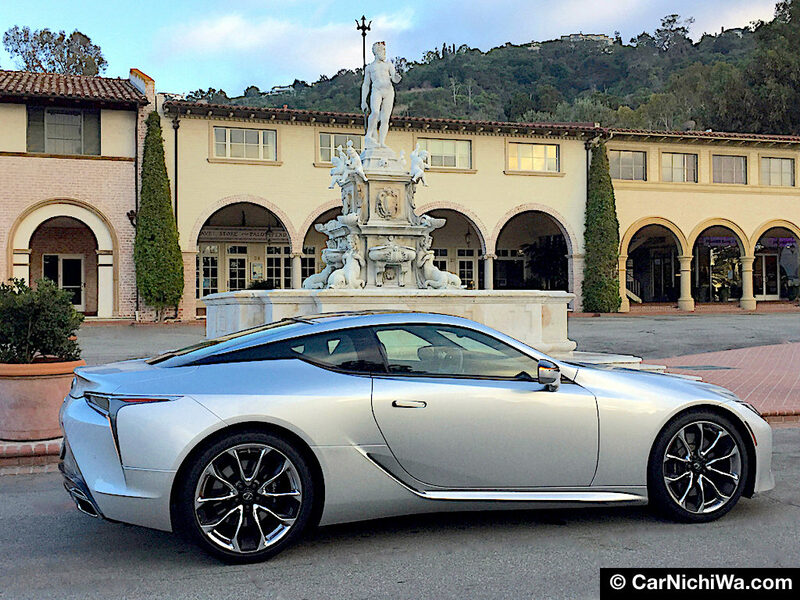 While Compagno was offered in a variety of models during its seven-year run, the coupe and convertible remain popular with collectors today. With a low, flat floor, the tall, boxy Daihatsu DN Pro Cargo concept can be configured to transport wheelchairs or industrial goods. 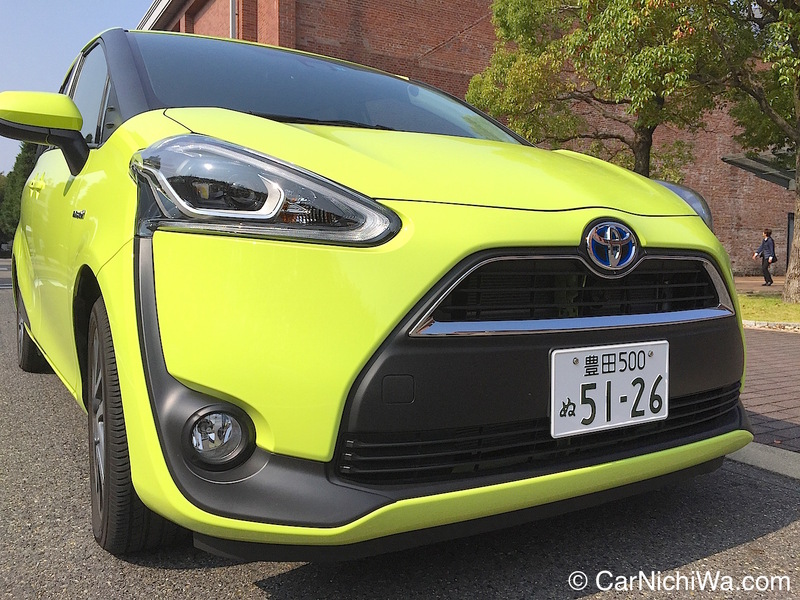 We take a closer look at new Daihatsu concepts in our above video. During its 110-year history, Daihatsu has catered to businesses with models like the Midget that was launched in 1957. The new DN Pro Cargo concept features a customizable multi-unit interior system that can be reconfigured for a variety of industries and uses. 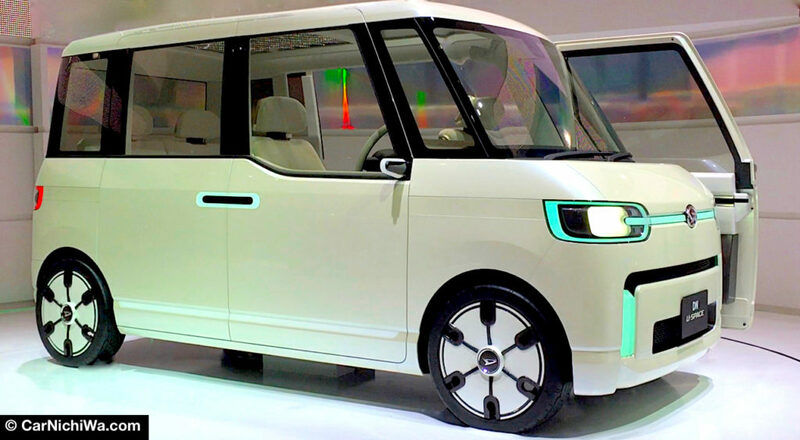 Daihatsu envisions the van as a commercial EV that could partner with workers in the future. 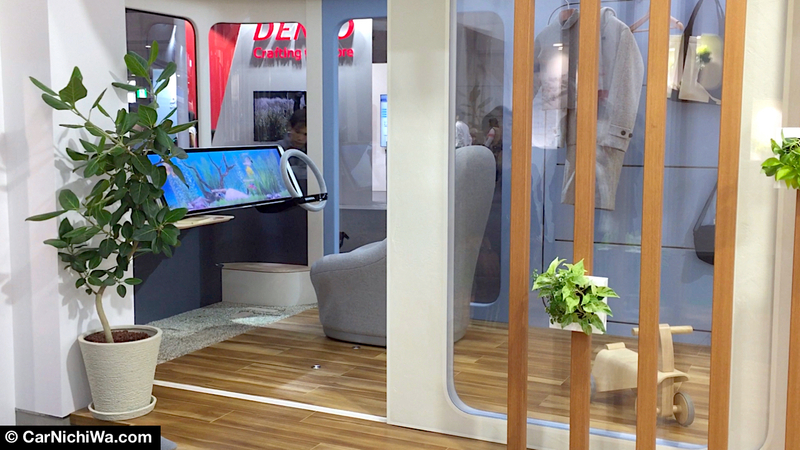 A bit more stylish yet still functional and flexible, Daihatsu’s new DN U-Space concept (above) is a multipurpose mini-vehcle offering panoramic views for passengers. Powered by a Kei-car class 660cc gas engine, U-Space has sliding front and rear doors with hands-free opening-and-closing plus a tip-up front passenger seat for ease of entry and exit. We captured several more Daihatsu concept and production vehicles in our above video including the Thor, DN Multisix, DN Trac and Boon. Thor is a cool-looking small boxy wagon that Daihatsu redesigned and launched last year in a variety of trims. 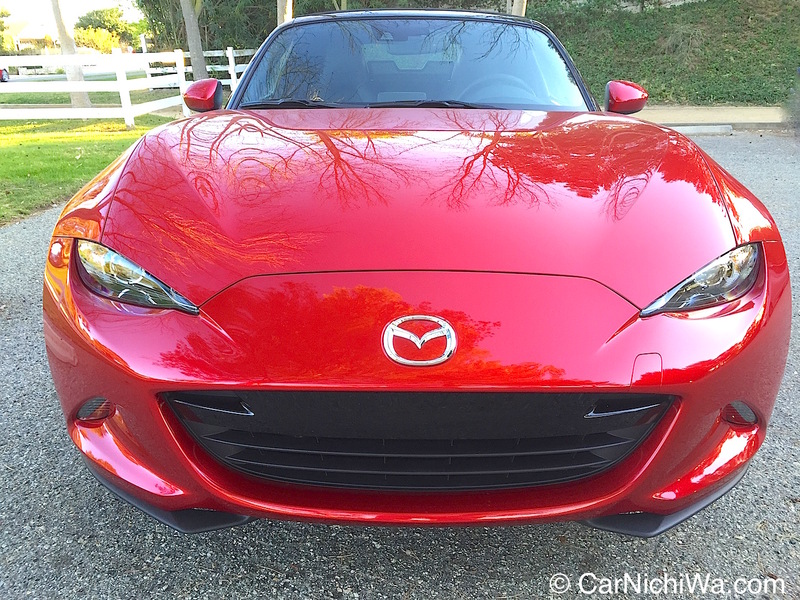 Powertrain choices include naturally aspirated and turbo 1.0-liter engines plus front or 4WD. 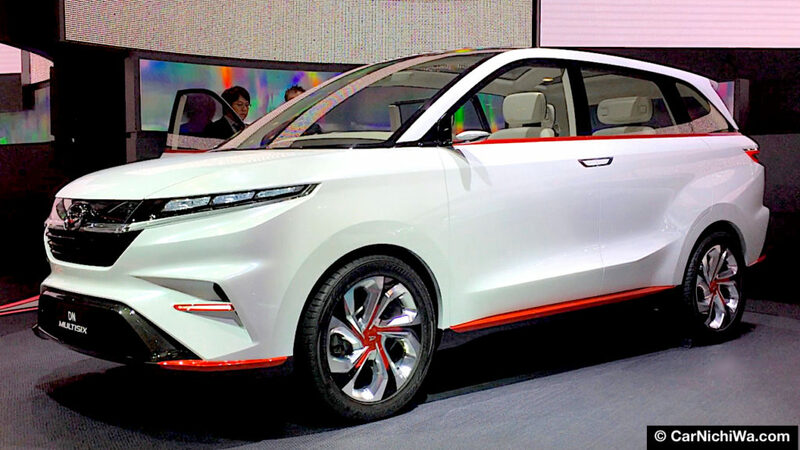 Daihatsu’s DN Multisix concept wears sleek styling that looks more like a crossover than a minivan. The cabin features three rows of seats with walk-through space from the first to the second and third rows for added convenience. Isuzu is known an innovator with its lineup of rugged commercial vehicles. 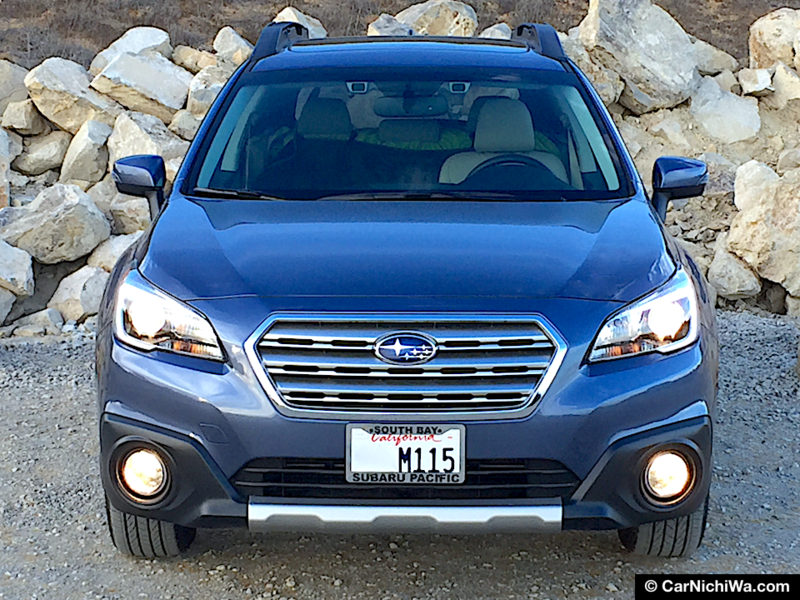 And it continues to offer midsize pickups and SUVs in various global markets (we wish these could return to the U.S.). 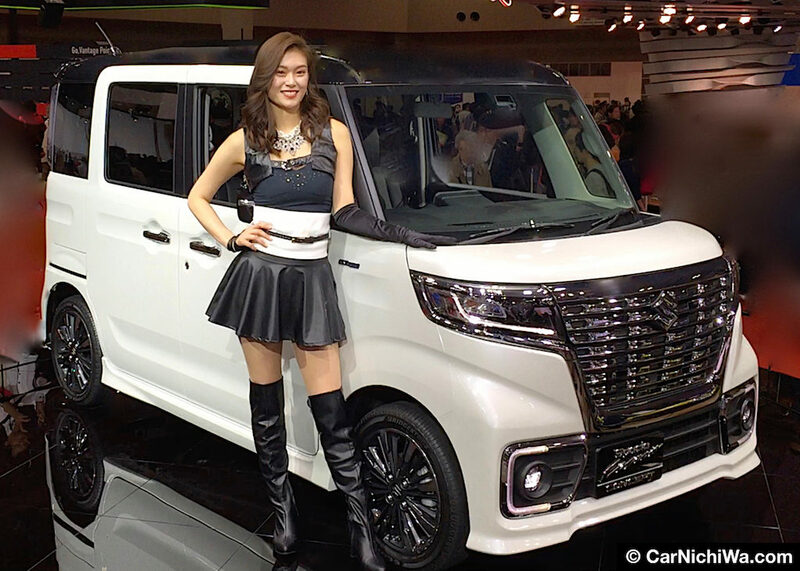 Let’s take a quick look at two Isuzu concepts and an updated production vehicle. 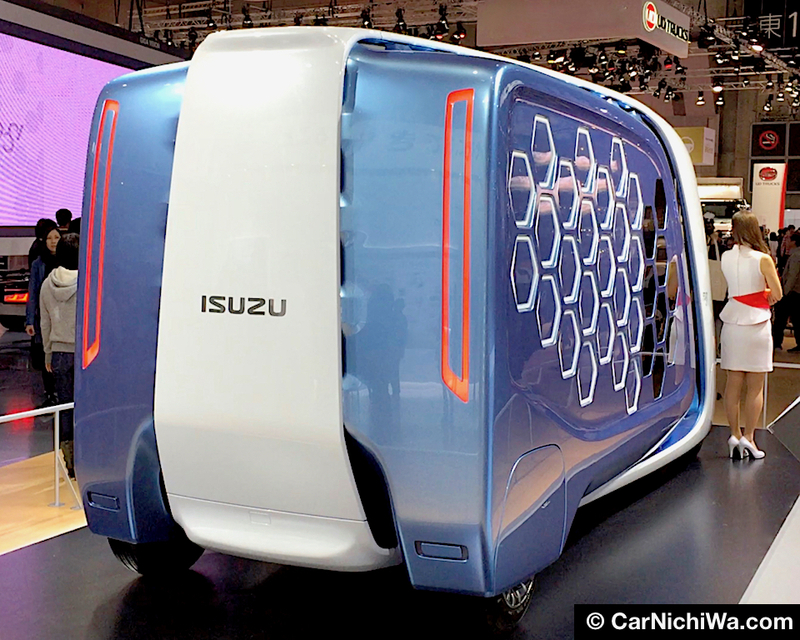 Isuzu is thinking about the future of delivery with the incredibly bold new concept called FD-SI that made its debut in Tokyo. Isuzu really knocked our socks off with the wild FD-SI “future delivery” concept. The truck maker says it focused on “group intelligence found in insect’s activities” and applied it to the collection and delivery method. While the exterior of the FD-SI features a honeycomb design, the cargo space is also structured like a honeycomb with hexagonal carriers for added strength and easy stacking. 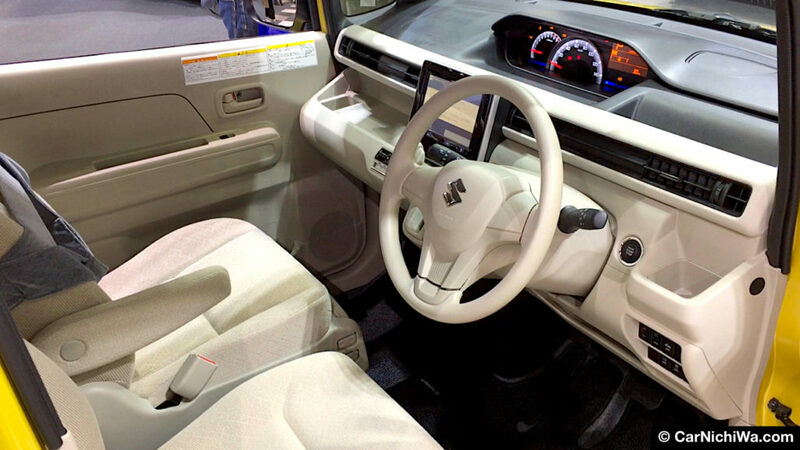 The cabin has a centrally mounted seat and controls plus a retractable steering wheel. 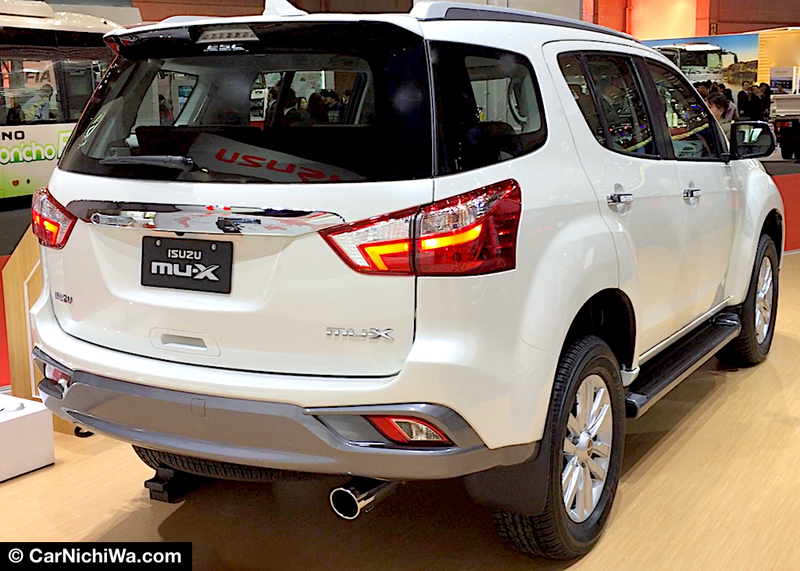 The MU-X is Isuzu’s current three-row SUV that’s sold in Asia, Oceania, the Middle East and Central America. We’re glad that Isuzu brought it to the show and we take a closer look in our above video. We have fond memories of Isuzu’s past SUVs including the Trooper and Rodeo. The MU-X is built on a rugged ladder frame, offers seats for seven passengers, a turbodiesel engine and shift-on-the-fly 4WD. The MU-X is derived from the D-Max pickup and related to sister vehicles including the current Chevrolet TrailBlazer and Colorado 7. The trio is built at General Motors’ Rayong plant in Thailand. 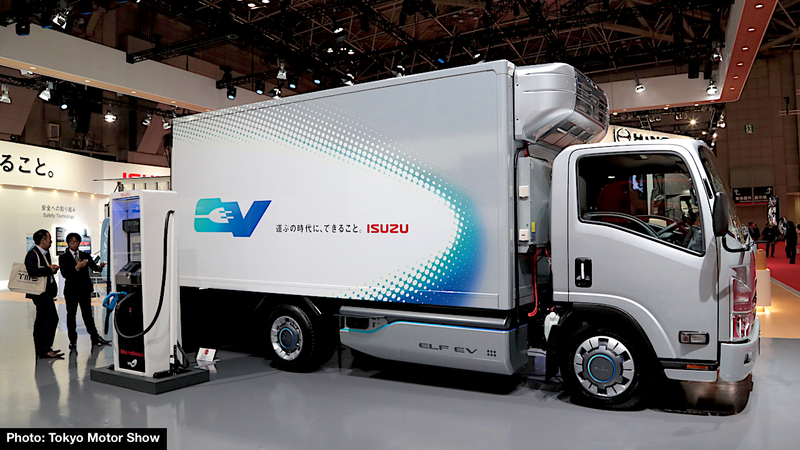 The ELF EV (above) is a new concept truck based on Isuzu’s popular low-cab-forward design. 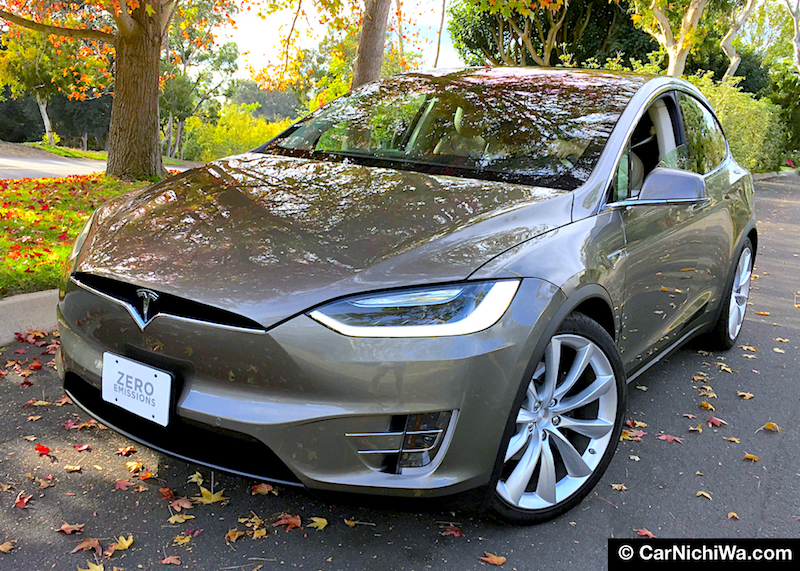 Instead of a diesel or gas engine, it’s powered by electricity and features a large capacity battery and quick charging. With the ability to drive deep into a warehouse without worrying about engine exhaust, Isuzu (and other truck makers) are looking to one day electrify their fleets. Will the vehicles of the future ride on two wheels or four? (Or perhaps no wheels at all?) 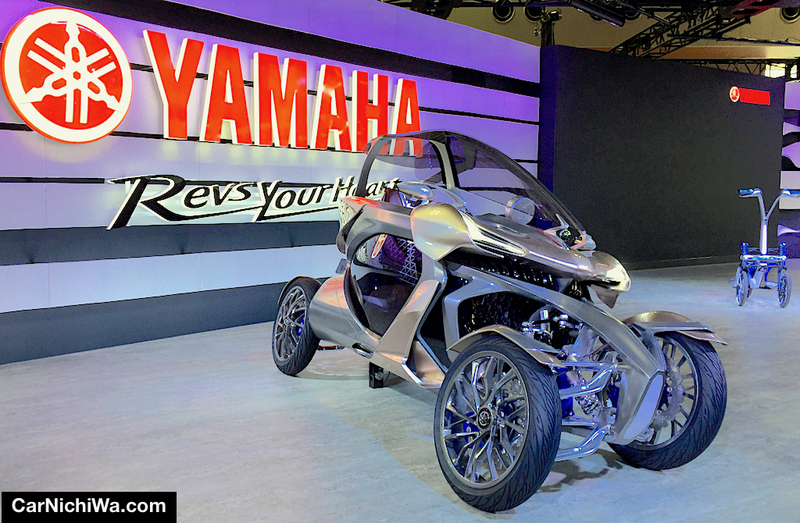 Yamaha’s exhibit was filled with creative concepts that explore the future of mobility. Yamaha’s new Cross Hub concept is a four-wheel adventure machine designed to connect with active and urban lifestyle enthusiasts. Yamaha is thinking about embarking on new adventures with the cool Cross Hub. 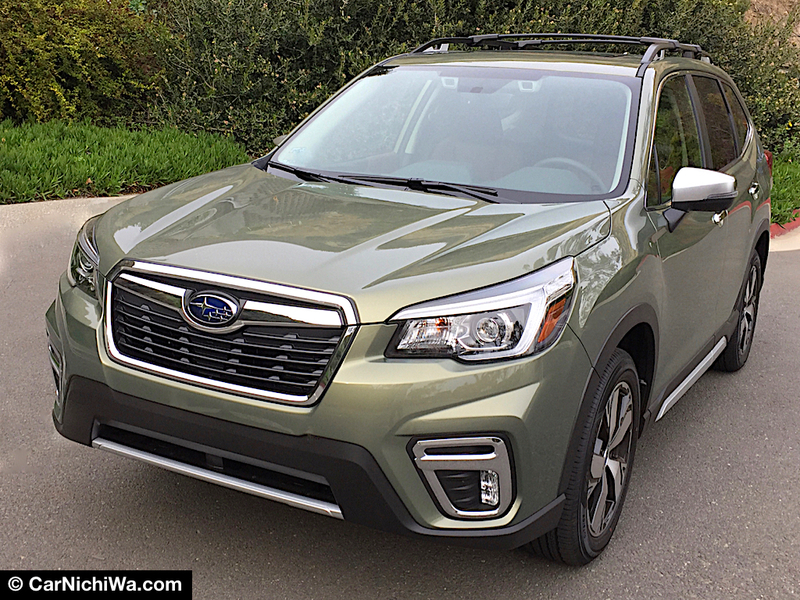 The concept looked ready to roll dressed with rugged design cues and sporting a pickup-style cargo bed. 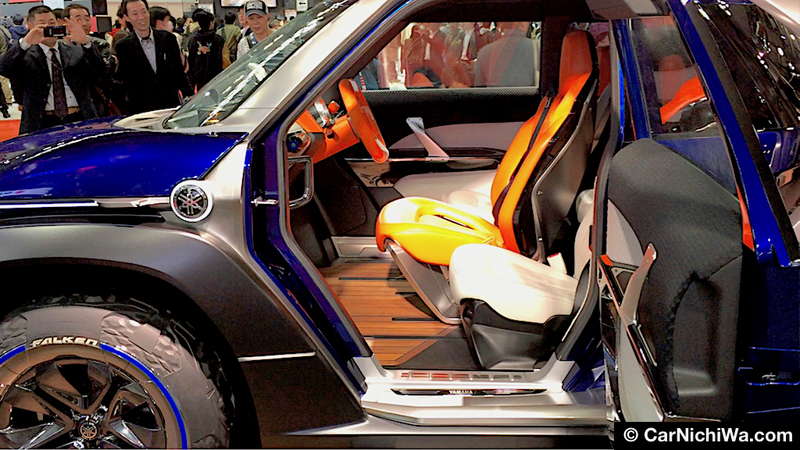 Inside the cabin is a futuristic diamond-shaped seating layout. This results in a truck with a short wheelbase that allows for excellent maneuverability in situations like tight off-road trails. 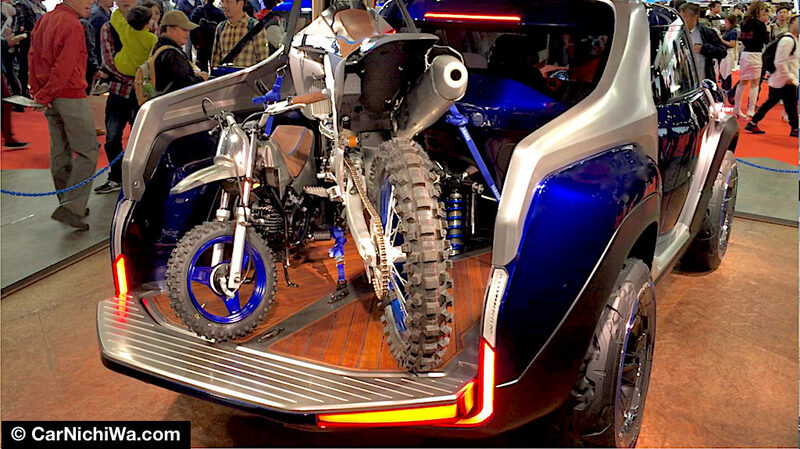 Two dirt bikes were displayed in the nicely crafted cargo bed. 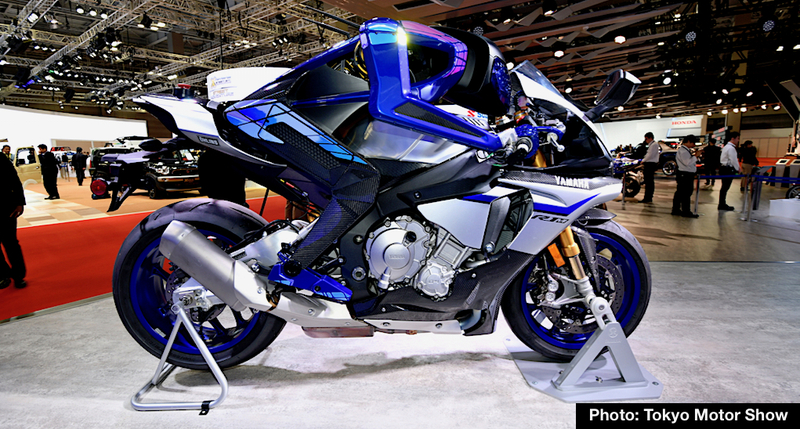 Now let’s take a look at a trio of other cool concepts on the Yamaha stand at Tokyo. Yamaha calls the new MWC-4 a “Leaning Multi-Wheel” vehicle developed under the concept “Half-Sized Mobility.” The lean machine is powered by two liquid-cooled electric motors and a small gasoline engine that serves as a range extender. Motoroid is another new concept that Yamaha says “employs artificial intelligence and explores creating new forms of personal mobility in which the rider resonates harmoniously with the machine.” It features a lithium-ion battery a rear-wheel hub motor. Motobot Ver. 2 is an autonomous motorcycle-riding robot that combines the latest in motorcycle and robotics technology for research and development. 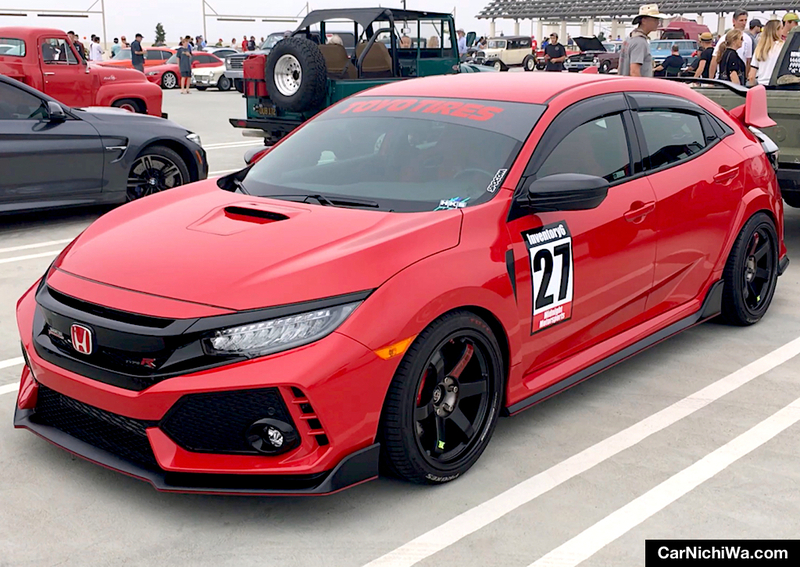 Reportedly capable of riding at high speeds around a racetrack, Yamaha says the knowledge gained from the concept in testing will be applied toward pioneering new businesses. 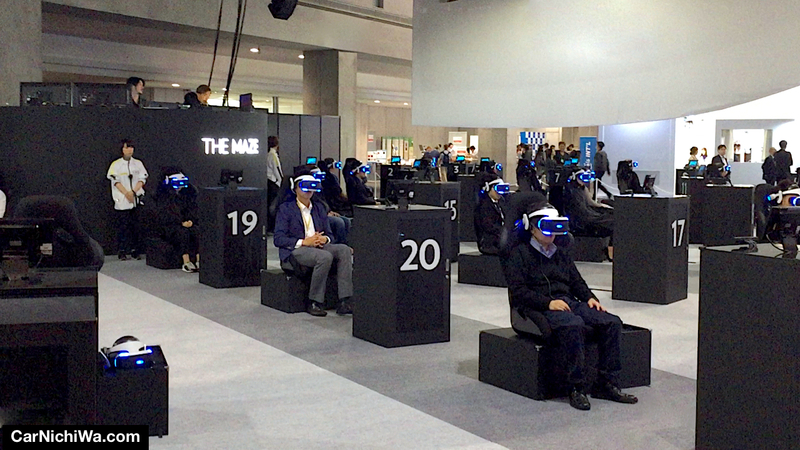 Tokyo Connected Lab is a new signature event at the Tokyo Motor Show. 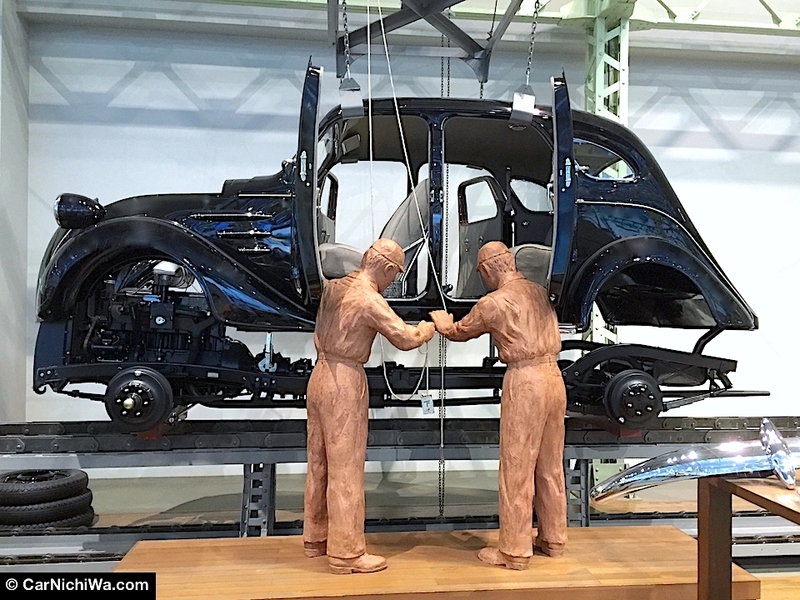 It featured interactive programs with opportunities to experience the connections and new values that may emerge with the mobility of the future. “It’s time to shift to high gear and set out on a borderless journey to redefine the very meaning of ‘automobile,'” says the show program. 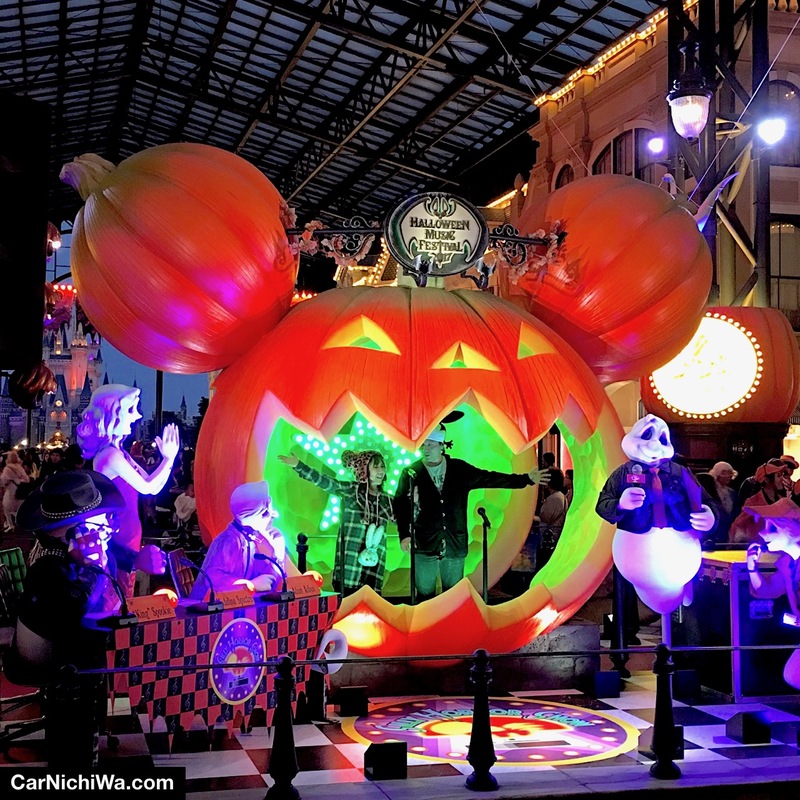 Let’s go inside and take a look. 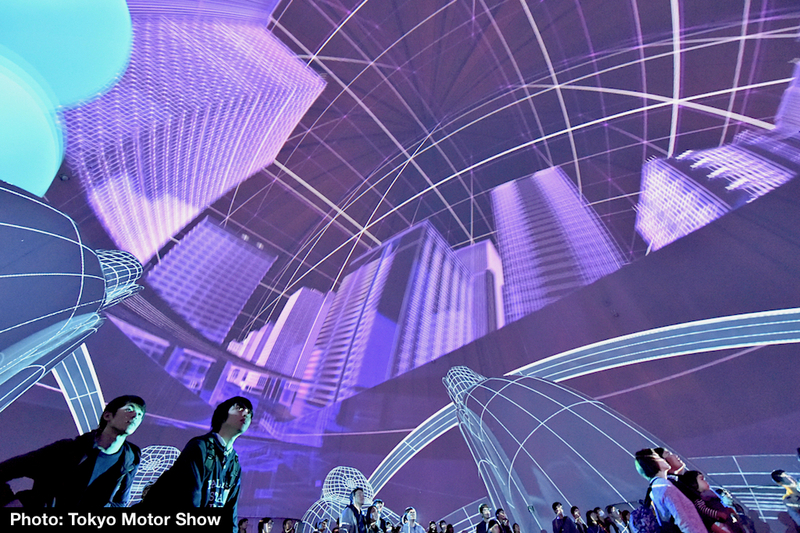 Built to visualize mobility in next-generation Tokyo, “The Future” featured a giant dome where up to 300 people at a time experienced 360-degree projection technology. 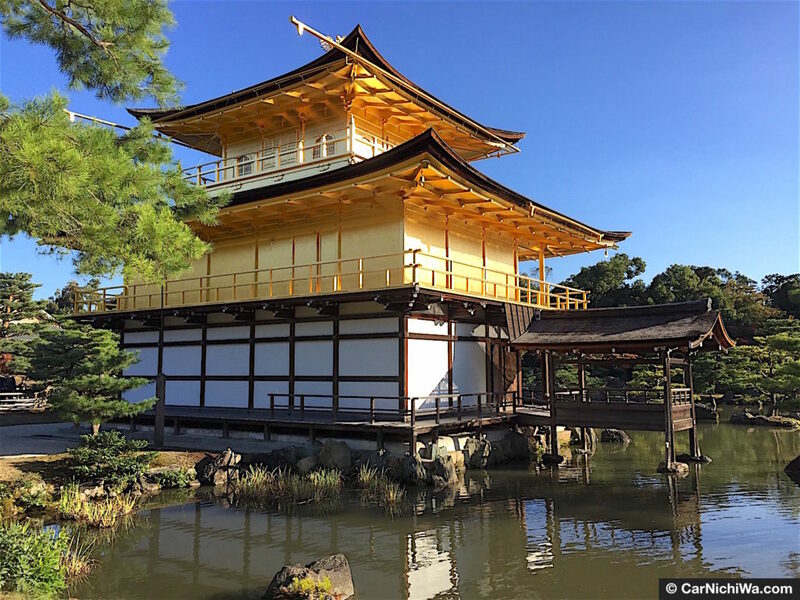 An interactive program for “The Future” incorporated autonomous driving, car sharing, personal mobility, and smart logistics planned for Tokyo in 2020 and beyond. Visuals were updated based on feedback from participants. 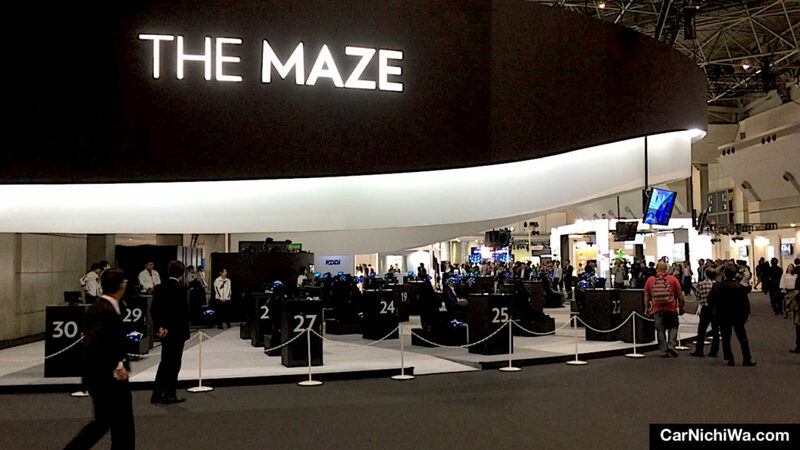 In a separate area, “The Maze” employed a networked VR system where up to 30 participants could simultaneously drive through a virtual environment that explores things like the benefits of connected cars. In game-like scenarios, participants experienced automated driving, vehicle-to-vehicle, road-to-vehicle and pedestrian-to-vehicle communication and infrastructure-connected mobility services. 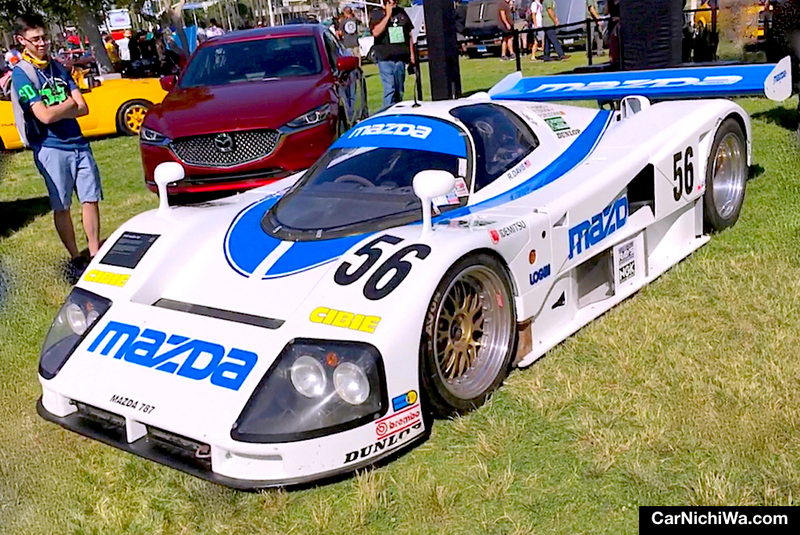 Meanwhile, in a separate area, automakers, related companies and government agencies staged their own sponsor-themed exhibits. 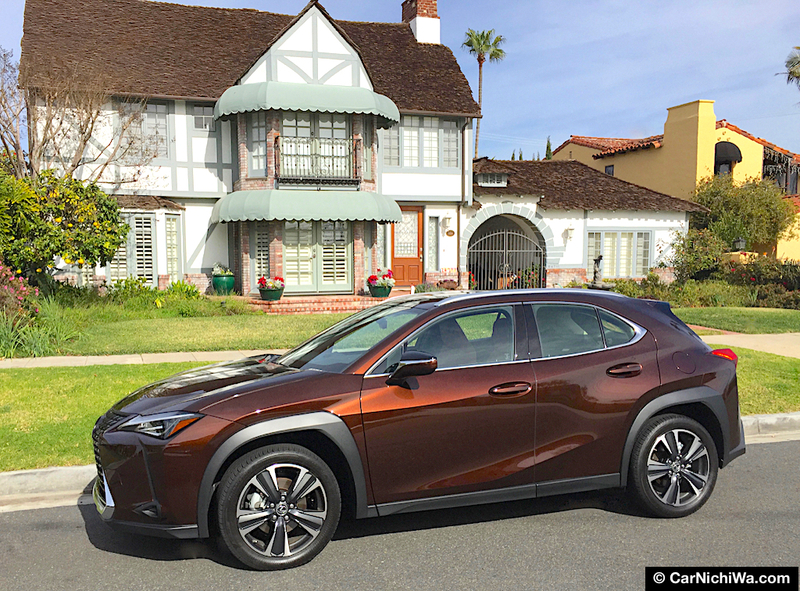 Imagine a future where a room in your house can be quickly detached and used as a car. 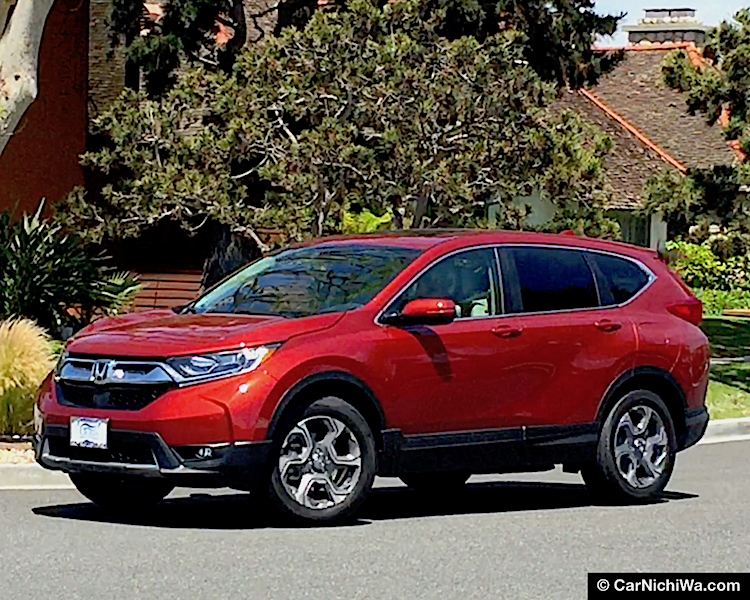 That’s the idea in a nutshell behind Honda’s new Ie-Mobi concept. 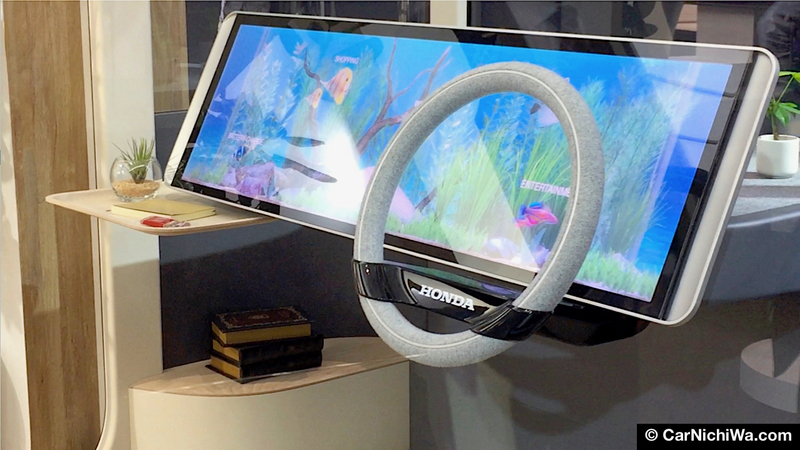 Honda’s Ie-Mobi concept seamlessly connects the car with the home – because it is a car. Take a look at this creative concept in our above video (and remember to take your shoes off before entering). 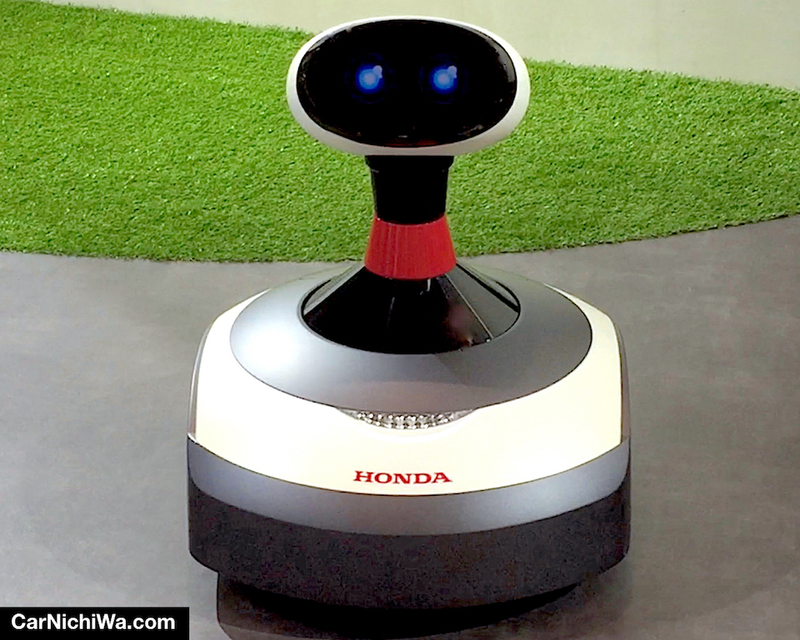 Honda says Ie-Mobi (“Ie” means “home” in Japanese and is pronounced “ee-a mo-bee”) is an electrical mobility concept of the future that makes it possible to supply electricity from the car to the home and from the home to the car. From this angle on the other side of the “house” Ie-Mobi is neatly integrated with its environment, including elegant wood floors, potted plants and all the comforts of home. The instrument panel, that looks like a huge tablet, played an aquarium-style screen-saver during our visit. Honda also showed the Fure-Mobi, a concept the size of a one-person wheelchair, that lets two people ride along together. Chair-Mobi is another concept that looks like a desk chair yet it can move and rotate under its own power. Ai-Miimo (above), based on the Honda Miimo, is a self-propelled robotic lawnmower fitted with AI which communicates and supports the user in everyday life. Thus a product as simple as a lawnmower could one day become a pet and family friend. 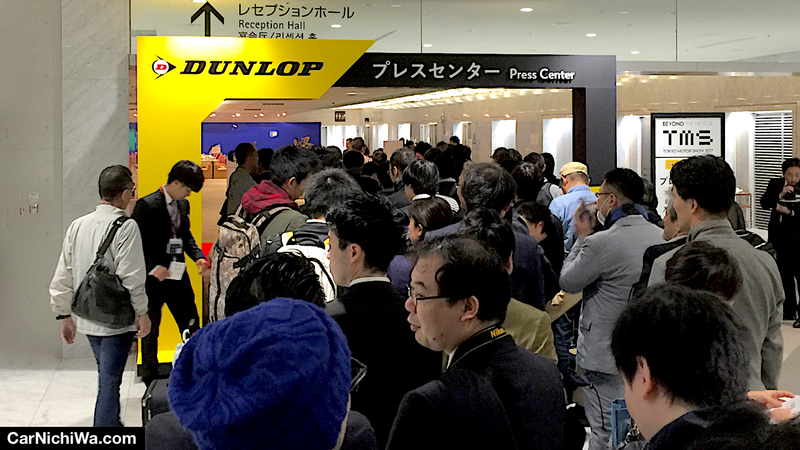 CarNichiWa.com thanks the Tokyo Motor Show for providing us with a press pass to the media preview days. 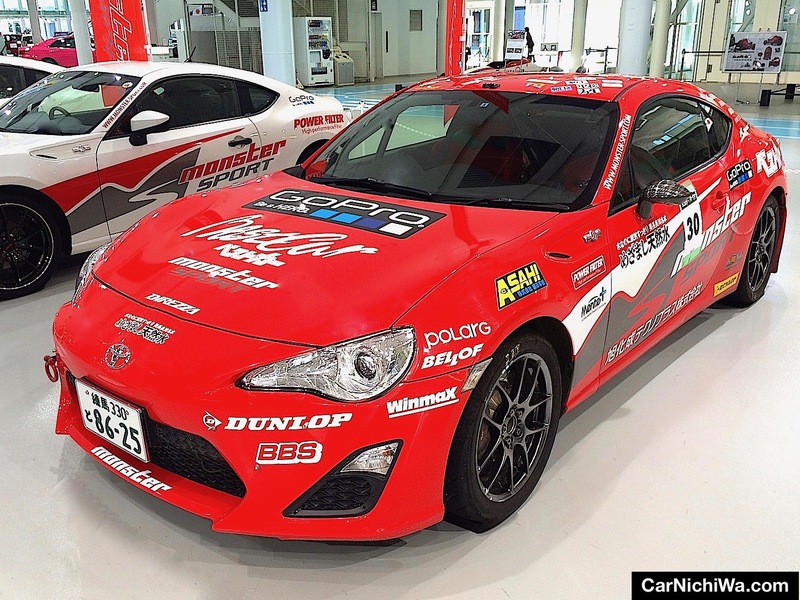 We also thank Suzuki Motor Corp., Daihatsu Motor Co., Ltd., Isuzu Motors, Ltd., Yamaha Motor Co., Ltd., and Honda Motor Co., Ltd. for access to display vehicles for this news report. 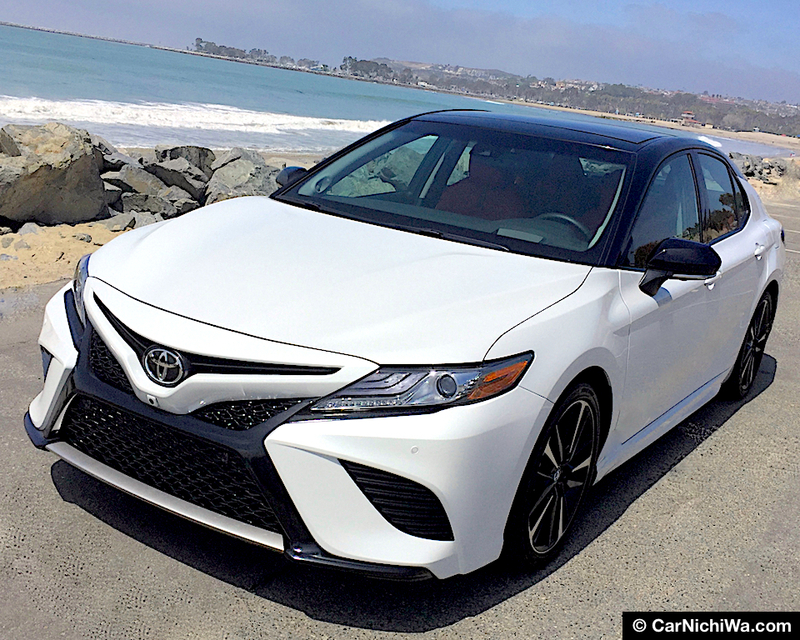 Note: Production vehicles, features, specifications and launch dates in this story apply to Japanese market models and are subject to change without notice. Additional photos (as noted) courtesy Tokyo Motor Show, Japan Automobile Manufacturers Association, Inc.